Classes are held on Mondays and Thursdays from 10:10-11:00 in MP606 classroom. Office hours are held on Wednesdays from 12:10-13:00 in my office MP1118. Wed10Apr: Did you see today's news from the Event Horizon Telescope? 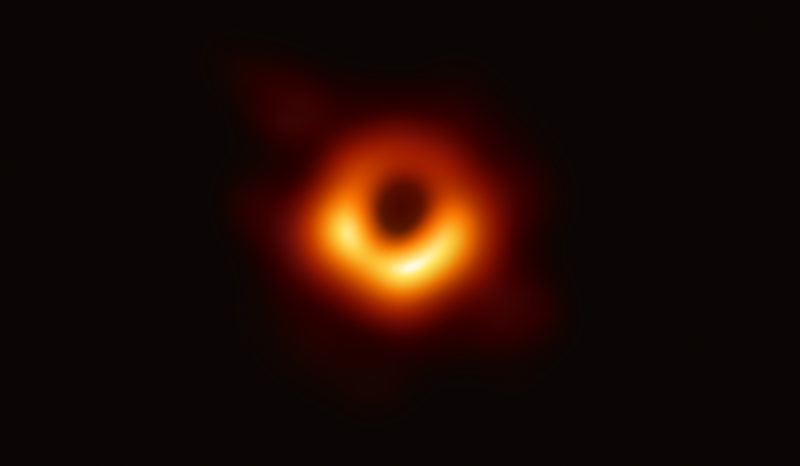 The team has taken the very first direct picture of the light ring around a black hole at the centre of M87, a nearby galaxy also known as Virgo A. Observations are consistent with a Kerr black hole of about 6.5 billion solar masses. Sun07Mar: the TA has graded all HW4s submitted so far. I have decided to scale up the raw HW4 grades [below 100] using $y=(10x+1260)/23$. Marked HW4s will be available from me from tomorrow lunchtime -- or come by during office hours on Wednesday at noon. Thu04Mar: the TA is aiming to get HW4s handed in by today graded by Monday. Assignments submitted later will be handed back later, ideally by Tuesday. Thu04Mar: an eagle-eyed student pointed out that there was a missing factor of $(D-3)$ in the Hawking temperature in Q3. ðŸ™„ My apologies for the confusion. Noone will be penalized for this during grading. Thu04Mar: I have taken a careful look at the grading spreadsheets and decided to apply (upwards) linear scalings to raw scores [below 100%] for HW1 and HW3. The equations are: $y=(23x+980)/33$ for HW1 and $y=(x+97)/2$ for HW3, where $x$ is the original % and $y$ is the scaled %. Thu28Mar: An eagle-eyed student noticed a missing $1/16\pi G_N$ factor in the energy-momentum tensor of Q4. HW4 question updated. Tue26Mar: On Thu.28.Mar, I will offer a tutorial instead of a lecture. You can ask any question you like about HW4 or the upcoming final exam. Tell your friends who are also taking this course but thinking of skipping class! Mon25Mar: an eagle eyed student has noticed two typos in HW4 problem 4. They have been corrected -- please download the new version pronto. Please feel free to bring any other suspected typos to my attention! Qualitative question, short essay style, in which you explain the top three coolest concepts you learned about in this course at a level accessible to students who finished GR1 PHY483F. The only restriction is that you cannot pick one of the following topics, which will be examined in the other questions. Mon18Mar: HW4 is posted. It will be due at the beginning of class on April 1st (no, this is not an April Fool!). I have tried to make it fun; if you find it isn't, feel free to ask me for tips. Mon18Mar: today's class is based on my 2015 Perimeter Institute public lecture. Thu14Mar: Graduate students: I have a proposed date for our final exam: Monday 22nd April from 1-5pm. Please let me know ASAP if this is somehow not convenient as previously discussed. Note: you will only be required to attend during the half-hour allocated to your own presentation. M11Mar: HW2 assignments are graded. I have them in my office. W28Feb: All grad students enrolled in this course were supposed to have proposed a final project topic to me by now, but so far only one of you has. Please discuss this with me ASAP, so that you can begin preparing properly before the end of term arrives. Apparently the undergraduate exam timetable will finally be posted this Friday, which will (at last!) enable us to schedule the date of our PHY1484S exam, which we will do together next Monday at the start of class. Please be sure to bring information with you about the dates of any other exams you will be taking, so that we can choose wisely. W27Feb: Homework 3 is posted. As previously advertised, it will be due on R14Mar. I hope you find it a useful illumination of the principles of inflationary perturbations as discussed in lectures. Please feel free to give feedback on difficulty level and to seek my assistance with problems, either in weekly office hours or more informally. M11Feb: Homework 2 is posted. It is intended as a relatively straightforward way of learning the key physics points presented in lectures. It is not supposed to cause significant suffering, so please ask me for assistance if it does, either in regular office hours or by making a Skype appointment via email. R07Feb: the vote on moving remaining homework due dates one lecture later was overwhelmingly in favour. Accordingly, the remaining HW2, HW3, HW4 due dates will be M25Feb, R14Mar, M01Apr respectively. T05Feb: If you would like to discuss the idea of moving HW2,3,4 due dates back half a week with me and other class members, please come 5-10 minutes early on Thursday morning. The vote will be done at the start of class. M04Feb: I would like to propose moving the due dates for HW2, HW3 and HW4 later by one lecture (3-4 days). Since this is technically a change of the grading scheme, I am required to take a vote on it in class. This will be done on R07Feb, because one lecture's worth of notice is required. M28Jan: Since I posted Q3 of HW1 later than planned, I am giving you all three extra days to finish HW1: it will now be due on R07Feb instead of M04Feb. M28Jan: I have posted the third HW1 problem. T22Jan: I have posted the first two problems of HW1. Please alert me if you find any bugs in the questions! R10Jan: Please send me an introductory email outlining a bit about yourself, what topics you are excited to learn about in this course, and what grade ballpark you are aiming for. Grad students should also describe their specific research interests. The purpose of this exercise is simply to help me do a better job of teaching you: answers will not be graded, and I will not be judgmental about them. But they will be very valuable, because I am teaching this course for the first time this year and prompt student feedback will be much appreciated. R10Jan: Office hours will be held Wednesdays at noon. This was one of the few times when only one student could not attend. If you cannot attend, and if catching me in the corridor after class is also not an option, then you are welcome to email me for private appointment(s). M07Jan: Apologies for the room mix-up this morning -- nobody seems to quite know how it happened, but it is fixed now. We will be using MP606 for classes, going forward. Apologies also for not being at my best this morning: I am really sick, and should probably have stayed home in bed. I will be staying in bed tomorrow and most of Wednesday, which should hopefully result in a better lecture on Thursday. M07Jan: welcome! I look forward to meeting you all.